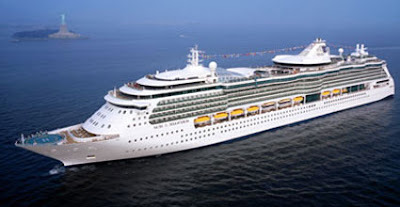 The Serenade of the Seas sails the Southern Caribbean during the winter and spring and Alaska during the summer. Right now there are great deals on fares for Southern Caribbean cruises, taking in San Juan - and depending on which cruise you pick, stops at Tortola, Philipsburg, Saint John, Castries and Saint Georges. Powered by two smokeless gas turbines, Serenade of the Seas is a sistership in the Radiance class, which includes Jewel of the Seas, Brilliance of the Seas and Radiance of the Seas. She has 12 passenger decks and nine passenger elevators, six of which are glass and either look over the Centrum atrium or outside the ship via a glass wall. The ship holds 2,490 guests and 891 crew. There are a total of 1,055 staterooms aboard, 829 of which are ocean view and 589 of those have balconies.